If you had the power to fix one thing, what would you fix? As a kid, I never got caught up in the whole comic book superhero thing. Superheroes are bigger than ever now that Spiderman, Batman, Superman, and the Avengers have taken over movies. Even Antman is … er big. And sadly, ninja turtles weren’t the most off-the-wall idea for superheroes. Ever heard of these? Hindsight Lad is more of a computer genius. He can analyze and see in hindsight how events could have played out if different actions were taken. I’m not sure why that makes him a superhero; my wife does that all the time. 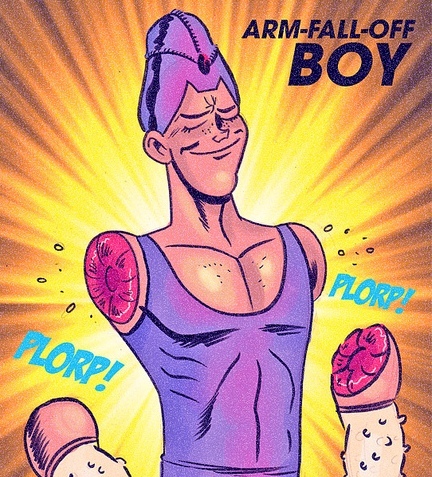 Arm-Fall-Off-Boy is misnamed. His arms don’t actually fall off; HE PULLS THEM OFF and uses them as weapons. While it does give new meaning to being someone’s “right-hand man,” I just have one question: if he pulls his arms off, how does he hold them as weapons? Rainbow Girl’s superpower is the ability to harness the powers of the “emotional spectrum.” That’s right; she fights evil with wild mood swings. I am so not going to comment on that. Almighty Dollar is an accountant with the ability to shoot pennies out of his wrists. I think his greater power would be as a CPA who actually understands tax laws. Squirrel Girl has the ability to communicate with squirrels. OK. Some girls I knew in high school probably thought they had the same ability every time they talked to me. I’m sure if you had a superpower, you’d use it for good. Right? But in this fictionalized scenario, you might remove injustice and corruption, but one thing would remain. You can’t remove sin. I don’t care what superpower you dream up, this on is beyond you. Let’s get back to the real world. Sin is a major problem. It robs us of everything God desires for us—including eternal life. We are enslaved by our own sin, and try as we may, we can’t get rid of it. “For I know that good itself does not dwell in me, that is, in my sinful nature. For I have the desire to do what is good, but I cannot carry it out. For I do not do the good I want to do, but the evil I do not want to do—this I keep on doing” (Rom. 7:18-19). Only One has the power. Better than any superpower, Jesus has divine power. Jesus stepped in and took our sin as His own. And He removed it. Completely. “What a wretched man I am! Who will rescue me from this body that is subject to death? Thanks be to God, who delivers me through Jesus Christ our Lord!” (vv. 24-25). This post is based on the study “One Great Problem” in Bible Studies for Life. A printable version is available to share with others: A Power Beyond Any Superhero.